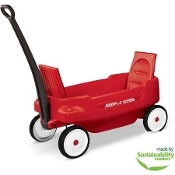 Our wagon for two features contoured seats, drink holders and plenty of leg room. It also includes seat belts for safety and reclining back rests. Great for walking the kids around the block or to the beach. Colors and styles may vary.